An optical technology that lines up living cells and controls their movements has been developed by Aristide Dogariu and colleagues at the University of Central Florida in Orlando. [This is ] an optical procedure that does not harm cells, but affects their skeletons – an ensemble of slender rods made out of an abundant protein called actin. The actin rods are constantly growing and shrinking inside of cells. The direction in which they grow changes the cell's membrane shape and dictates where the cell moves. Dogariu and colleagues use the polarization of optical waves to create a field around the cells in which the growing actin rods line up like a compass in the Earth's magnetic field. These optical fields can be used to guide large groups of cells to line up and move in the same direction. If this seems like a technology worthy of Star Trek... it is. 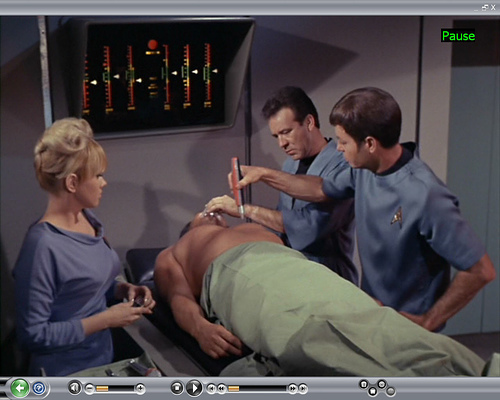 There are various references to a protoplaser going back to the the original series episode "Space Seed" - a device that heals by aligning nerves and muscle fibers. Via Eurekalert; thanks to Winchell Chung for the tip on this item.